Kowa spotting scopes are highly regarded, particularly among High Power and long-range prone shooters. You’ll always find many Kowas on the firing line at High Power matches. Many shooters get their Kowas from retired Marine Msgt. Jim Owens, who offers excellent prices on his JarHeadTop.com website. Kowa is replacing the venerable TSN-821M spotting scope with the newly redesigned TSN-82SV, which will be more compact with upgraded optics. The new TSN-82SV weighs 52.5 ounces, and is just 15.1″ long. The 82SV is waterproof and nitrogen-filled to to help eliminate lens fogging. The 82SV has a 45-degree angled eyepiece (puchased separately). 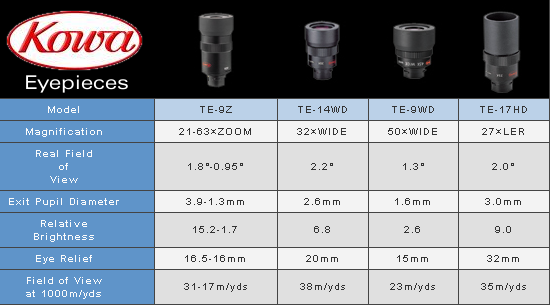 Four optional eyepieces are offered: TE-9Z, TE-14WD, TE-9WD, and TE-17HD. Specifications are listed in the chart below. Prone shooters will probably prefer the 27x TE-17HD long-eye-relief (LER) eyepiece. It offers a 2.0˚ real field of view (105 feet at 1000 yards), with about 1.25″ of eye relief. The MSRP for the new TSN-82SV is $805.00 (body only), while the “street price” is currently about $650.00 without eyepiece. See: Eagle Optics, $645. By contrast, Kowa’s larger TSN 881 88mm spotter runs $999.00 without eyepiece. Share the post "Kowa Introduces TSN-82SV Spotting Scope"